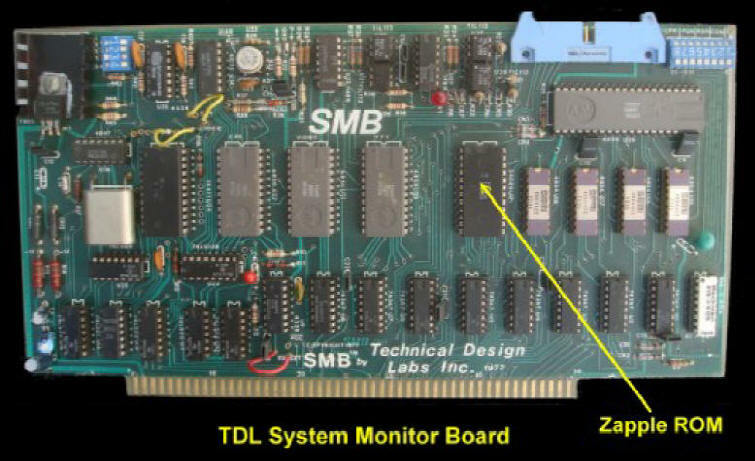 My first computer was centered around the TDL system monitor board. This very useful S-100 board had a wonderful Z80 monitor in its custom 4K ROM. It was called "Zapple". It was an extension of an 8080 monitor program written by Roger Amidon called "Apple" back in the mid 70's. It had all the basic requirements such as allowing the user to examine/modify RAM or IO ports. Output to a console, printer, punch, tape reader (these were the Teletype days) or cassette recorder. It was really the first to do the obvious, namely have all jump calls at the start of the program - for easy access by other programs and allow redirection of output by changing an "IOBYTE" stored in an IO port. Over the years this monitor code has been copied and modified many times over by others. I too have extensively modified it to incorporate things like booting the first sector of a floppy disk to load CPM. Or doing the same thing for my hard disk. I even have code in there to direct output to my speech synthesizer, run a date/clock chip etc. I no longer use the original SMB, instead the monitor now resides in the EEPROM of the S100Computers Z80 CPU Board. I am enclosing the complete source code for the monitor (see Below). Display memory map for any segment up to 1 MG.
Download code from another Computer/PC over a serial/USB port and place it in RAM at any location (0H to 0FFFFFH) using the XMODEM protocol. Jump to code in RAM. As you can see the program is written in Z80 code. It should assemble with almost any Z80 assembler. In the past I used the SD Systems assembler simply because that's what I started with. It has a slight quirk in that the data fields "DB", "DW" require "DEFB" and "DEFW". The good news is that strings can be written with "DEFM". I also used the Cromemco Assembler, but that one has a quirk in that it will not accept names with "$" or "_" character. I have now switched over all my stuff to the SLR Z80 assembler. Kicking myself i did not do this earlier! It is extremely fast and produces .COM or .HEX files directly. To review and download a CPM based assembler go here. Z80 Monitor Software For The V2 Z80 CPU Board. This ability to flip 4K "pages" within the ROM in the V2 Z80 CPU Board effectively allows one to almost double the effective size of the code in your Z80 monitor. The only thing to watch out for is that the actual code used for the switch reside in EXACTLY the same place in both 4K pages. I have modified the above well tested Master.Z80 monitor to have Floppy disk/CPM booting code in the lower 4K and the ability to download a XModem formatted file directly to RAM from a PC (via a serial port) in the upper 4K. You can actually do a lot with 8K of ROM with a Z80 -- just be careful about the common code used during the switch. Z80 Monitor Software V5.5 for theV2 Z80 CPU Board. This ability to flip 4K "pages" within the ROM in the V2 Z80 CPU Board as described above works fine, however it is very inefficient in terms of ROM bytes utilized. It is essentially a duplication of the lower page in the upper page with a few lower routines replaced with the XModem menu option in the upper page. The menu text for example is in both pages and one has to enter a menu option "XH" or "XL" to switch pages. While working on a similar arrangement for our PDP11 CPU monitor it became apparent that a much more efficient approach is to have the upper menu items call a "PAGE SWITCH" routine, switching the page themselves, do their thing and then switch back to the main menu/lower page. Only essential support routines (console I/O etc.) need be duplicate in the upper page. This approach allows for a much more compact/efficient monitor with well over 1K of free ROM space currently available for expansion. Let's go through the theory and code in detail. The actual MASTER monitor assembly language code is split into two completely separate files, MASTER0.Z80 and MASTER1.Z80. It is very important to understand that the code in either file knows nothing about the code in the other. The vast majority of the monitor code (currently) resides in the MASTER0.Z80 file. In fact you can use this code/file alone to run the monitor just as you did for the earlier "single page" monitor e.g. the V4.7 monitor. It will for example run fine in the original S100Computers Z80 CPU board. Currently only one menu option, the "X" (XModem) command, resides in the High Page for the MASTER V5.4 and later versions. Any further new code will probably also reside there. JP NoHighPageError ; Will arrive here only IF no address line switch. The trick is that we use bit 1 of port Z80PORT+3 on the Z80 board circuit to switch the address line LA13 from LOW to HIGH going to the EEPROM. 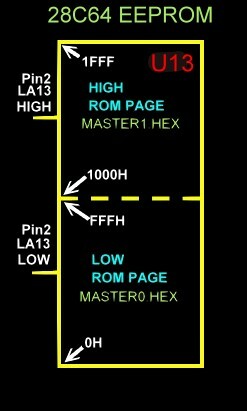 The yellow text code above moves (unknown to the CPU) from the lower to the upper ROM page. This common code is the link between both pages. We load a menu option number into the [D] register, jump to the "Switching Routine", it is picked up in the HIGH page and processed in the normal way depending on the [D] menu number passed to it. When done, we jump to the ACTIVETE_LOW PAGE which lowers the LA13 line and again (Port D3, bit 1 ->LOW), unknown to the CPU it ends up in the LOW PAGE. This code is in purple above. It takes a little time to really understand this process. Remember the CPU does not know anything about this process. After the port output is done, the CPU does whatever the next opcode in that ROM (page) requires. This facility allows us plenty of future space to write quite elaborate functions in the 4K (now 8K) ROM space between F000H and FFFFH on the V2 CPU board. There is however one catch, programming the ROMs is quite tricky. You have to place the 2 segments of code exactly as shown in the above diagram. You are already familiar by now I assume of burning a ROM. The added twist here is we need to place two files in the ROM. MASTER0.HEX in the lower page and MASTER1.HEX in the upper page. You have to be careful when you load up the second file you don't overwrite the first file. Assemble and make two .HEX files, MASTER0.HEX and MASTER1.HEX. Program ("Burn" ) the above ROM code. 1. Rich Camarda noticed that when using the Serial Board as the Console, (with the I/O Byte set as 11011111), and no Propeller Board in the system, you get a constant scrolling cursor. The Serial Board functions well in all other aspects. If you have the Propeller Video board in the system along with the Serial Board, the output to the console goes to both, and the Serial terminal works fine. Rich modified the console I/O routines to fix this bug. The patched version of the Master Z80 can be obtained below. Basically he added 3 lines to the beginning of each console routine, and put some of the serial calls at the bottom. Versions 5.3 or later of Master.Z80 has corrected the above error. Now, if bit 5 of the IOBYTE port is 0 the monitor will assume the Serial port on our Serial-IO board is the console. If no IOBYTE port is present or bit 5 of the IOBYTE port is 1 then the monitor will assume that our Propeller driven Console IO board is the Console. 2. David Fry has spent some time on the CF card compatibility issue with our IDE Boards where some CF cards will not boot CPM properly using the monitor "P" command. He noted that in the V5.4 monitor (and previous versions), that HBOOTCPM routine performs a 12 sector read in one pass. He concluded that some cards require that the blockRead requests be in powers of 2 (2,4,8 or 16...). So he rewrote this section of the monitor to perform the CPMLDR read using single sector reads in a loop of 12 iterations. This seems to have solved that annoying problem, allowing many if not all CF cards to work fine. Thanks Dave! The monitor code V5.5 below now incorporates this modification and should be updated in the onboard ROMs of all our Z80 CPU boards. 3. One subtle point, the CPM program HEXCOM (which converts a .HEX file to a .com) file behaves unexpectedly, (unrelated to this monitor). If you set a our MASTER0.Z80 program assembly org at say 100H the program will generate a .com (.bin) file correctly and you can use XModem to load it to RAM at 100H and run it with the Monitor "G" command. This is very useful for testing monitor changes -- instead of burning a new ROM each time. If however you set the org to 1000H in the code, you have to subtract 100H bytes from the load location of the final .com file. So to run such a program at, say, 1000H, you would load it at F00H in RAM with XModem. "MASTER.Z80" MONITOR SOFTWARE V4.7 (V4.7, FINAL, 11/07/2011) (<----- This is the last vesrion of the simple "one ROM" monitor).